One day I reinvented the bacon-freezing wheel, and found it made life so much easier. So naturally, I want to share that here to make your life easier as well. After all, anything that gets the bacon out of the freezer and onto your plate faster is a good thing, right? I used to take a few strips at a time, stacked together, and wrap them tightly in plastic. I would freeze these little packets and then on Bacon Day, either thaw them in the refrigerator overnight (on the odd chance that I planned ahead), or else in the microwave that morning (more typical). Thawing frozen bacon is messy, though, and using the microwave can sometimes leave the stack a little frozen in the middle while the outer edges start to cook, and then it’s all just a soppy wet mess. I start by cutting the entire package right down the middle. I just find half-slices are easier to work with. 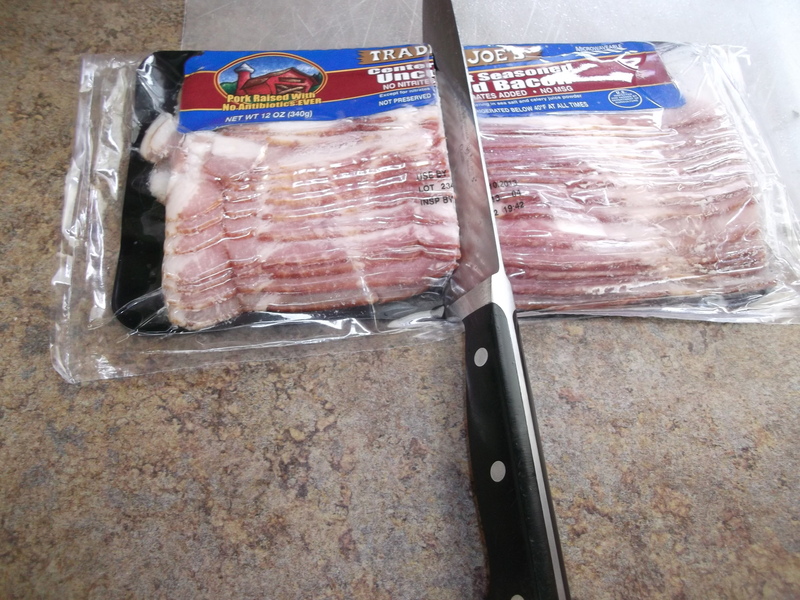 Once the cutting boards/mats (or dinner plates, as the case may be) are lined with bacon, I place them in the freezer. No need to cover them; just lie them flat. A few hours later, when each slice is frozen individually, I simply bend the mat and slide all the bacon into a freezer bag. Now I have a bag of individually frozen strips of bacon that goes right back in the freezer. I also include the package label so I know which brand it is. I keep switching brands and usually have two of three different brands or types in the freezer. They don’t even need to be thawed first: I put them right in the frying pan and they fry up crispy every time! maybe if you place them on parchment paper you would not need to spray the mat?